A classical herbal oil massage, using vigorous downward strokes to apply pressure to muscles, nerves and vital points on the body. • Sharira abhyangam - A classical herbal oil massage for the entire body. • Shiro Abhyangam - Herbal oil massage on the head and neck done in rhythmic movements. 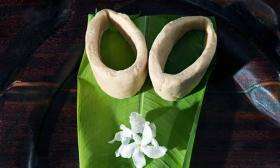 • Mukha Abhyangam - A traditional invigorating facial massage involving the application of snehadravyas (oil, ghee, etc.) using circular strokes. • Pada Abhyangam - A stimulating foot massage involving the application of oil with specific pressure and in specific directions. 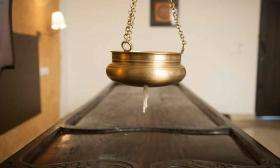 Body is first massaged and then made to perspire by pouring a constant stream of extracts depending on body conditions from a special vessel placed at a certain height. 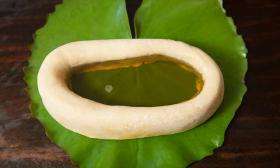 • Kashayadhara - Herbal water extracts are used. 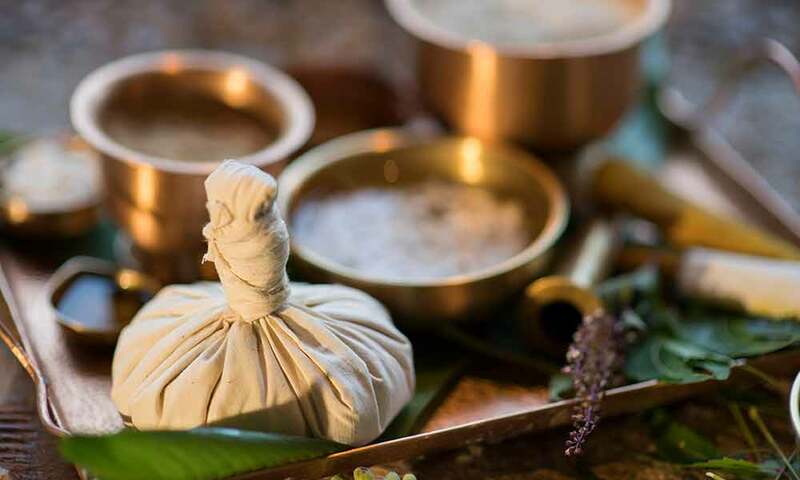 • Pizhchil / Thailadhara - Continuous streams of warm medicated herbal oils are soothingly poured over the body by two Ayurvedic therapists as they gently massage the body in perfect unison. Nourishing deep massage treatment in which heated bolus bags are applied either locally or to the entire body. Depending on the nature of the medical condition, the bolus bags may contain choorna (herbal powders), patra (assorted fried herbal leaves), jambeera (lemon) or shashtika (njavara rice, a type of Indian herbal rice). For some conditions, a medicated oil massage may be done prior to the application of bolus bags. Sweating is triggered by seating the patient in a large tub filled with warm medicated liquid, maintained at a constant temperature. Gentle application of warm, thick herbal paste (blend of many potent herbs, spices, juices of leaves) on any afflicted area. Long, thick layer of cotton wool soaked with warm medicated oil is applied over the affected area. 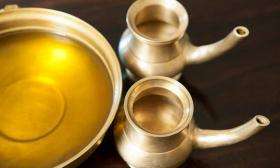 The oil is replaced periodically to keep it warm and therapeutic. It can be applied on different parts of the body, such as the head, neck, limbs, etc. 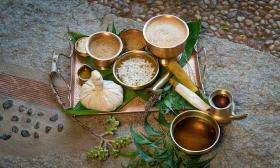 Herbal paste is applied evenly all over the head and covered first with plantain leaf and then with a cloth. A small hole is made in the center of the covering and medicated oil is kept there. 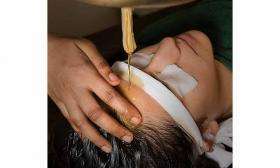 Oil and paste are removed after a specific period and a mild head massage is administered. Medicated herbal or oil-based enemas specially prepared and administered. Nasal orifices are believed to be the gateway to the head. 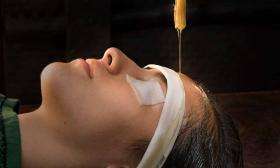 In this treatment, herbal powders, juices and medicated oils are administered through the nostrils. 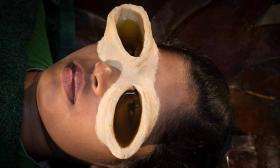 • Netra Lepam - Paste made of different cooling herbs is applied to the eyes after washing with herbal decoction. Not only treats eye conditions, but also cools the eyes.